Bear Creek Campground is the on-site campground for the Lake Conpounce amusement park. It’s the oldest park in the US but Bear Creek was built in 2014 so it is a relatively new park. 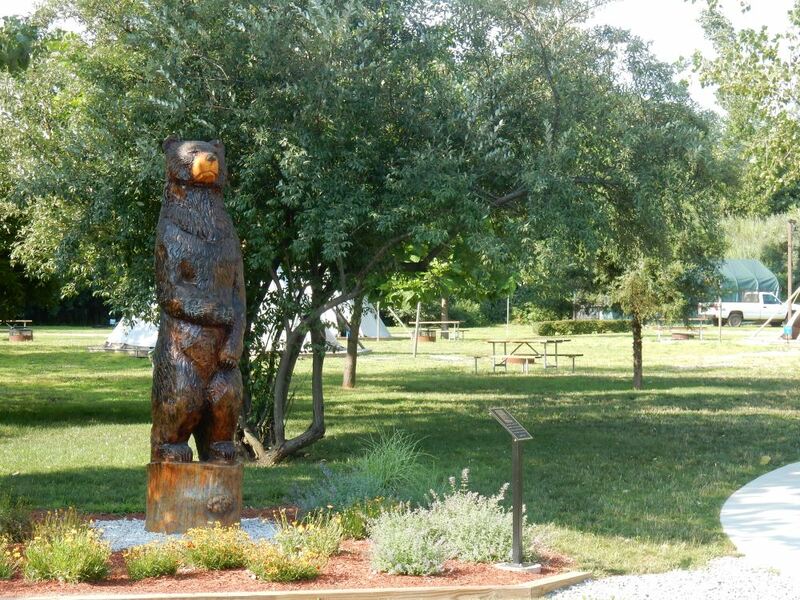 One of the many chainsaw carvings of a bear on-site. Bear Creek Campground feels like it is out in the deep woods, but it is actually located pretty close to a small town and a large amusement park, famous for being the oldest in the nation. We didn’t go to the Lake Compunce amusement park but we could see the huge roller coasters rising above the trees as we drove to and from our campground. While it serves the amusement park, anyone can book a spot at Bear Creek. The camping sites are in a large clearing surrounded by trees. They offer a lot of room, especially compared to the relatively cramped parks we’d been staying at as of late in the northeast. The only real problem with the parking sites themselves is they don’t have sewer hook ups. You have to use the dumping station on the way out of the park. That’s never convenient for a longer stay. Fortunately, ours was brief. It’s a long drive from the entrance of the amusement park to the entrance to the RV park, so keep that in mind while navigating here. When you do arrive you will notice the great camp store/office with the huge bear on top of it. All the signs and artwork they have is pretty great here. The park store has a lot more toys and stuffed animals than camp supplies, but it covers the basics and has lots of treats on offer. The bathrooms and private showers were great, with lots of hot water. They were not as clean as they could be, but good enough. The playground area was very nicely appointed as you might expect for an amusement park. They even had a dunk tank available, something I’ve never seen at an RV park before. Some cool Tee-pees were available for campers as well. They have free Cable TV but for some reason, the picture was fuzzy on all the channels we tried. Their laundry was quite nice and cheaper than most. The lack of sewer hookups and the high price per night keep Bear Creek from getting my official recommendation. I loved the huge sites and the charming decorations but they aren’t enough to overcome the inconveniences of no sewer at more than $50 a night.